Dow Marmur makes use of misleading statistics when he claims an increase in anti-Semitism in Canada. The fault lies in how anti-Semitism is defined. For decades now, mainstream Jewish groups have attacked any criticism of Israel as being anti-Semitism. His "statistics" rely on that misconception. Israel's recent invasion of Lebanon, including the shelling of a U.N. observation post (killing a Canadian observer) and their targeting of Red Cross ambulances, was widely condemned. Their recent brutal assault on Gaza, which again saw their military targeting U.N. facilities and killing hundreds of civilians, convinced many that Israel is the real impediment to peace in the Middle East. Mainstream Judaism has gone to great lengths to equate supporting Israel with being Jewish. Synagogues sell Israel's bonds and parade their support for Israel on signs and billboards. And they condemn anyone who dares criticise Israel as criticising Judaism. They even attack members of their own community who speak out against Israel's actions. When a synagogue that flaunts its support for Israel is vandalized, is that anti-Semitism or anti-Zionism? With Jews themselves trying to erase the distinction between the two, is it any wonder that others in our society also fail to recognize the difference? This in no way excuses hate crimes or anti-Semitism but if we fail to understand why something is happening, we cannot hope to correct it. 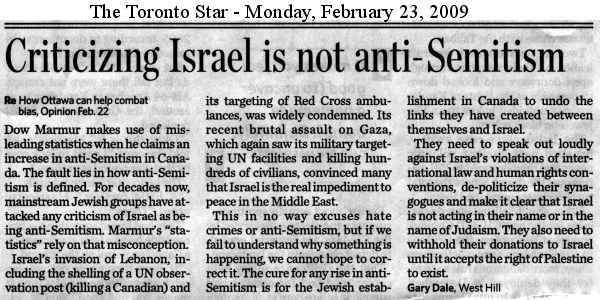 The cure for any rise in anti-Semitism is for the Jewish establishment in Canada to undo the links they have created between themselves and Israel. They need to speak out loudly against Israel's violations of international law and human rights conventions. They have to de-politicize their synagogues. They have to make it clear that Israel is not acting in their name or in the name of Judaism. They need to withhold their donations to Israel until it accepts the right of Palestine to exist. So long as the defining fact of Judaism is a small patch of land in the Middle East and so long as mainstream Judaism claims not only exclusive right to that patch of land but also supports any and all measures Israel undertakes to expand its control of it, I'm afraid we can only expect to see more of what Marmur calls "anti-Semitism".